We want to help you become the best purple teamer and boost your all-around skills. For this reason, we’ve decided to celebrate our first Purple Teamer month by offering you a free PTS training course in Elite Edition when you enroll in PTP Elite Edition too. The PTP course is the first of a series of 3 highly-practical training that makes the Purple Teamer training path — A deep dive into both advanced penetration testing and threat intelligence worlds. In the Penetration Testing Student (PTS) training course, you’ll learn Networking and Programming skills up to the most important basics of Penetration Testing. With the Elite Edition, you’ll be able to practice real-life scenarios for topics such as Bruteforce and Password Cracking, ARP Poisoning, and more. Read more about this course here. By completing this training course, you’ll have the choice to become a certified Junior Penetration Tester (eJPT). By passing this challenging exam and obtaining the eJPT certificate, you can prove your skills in the fastest growing area of information security. Learn more about this certification here. In the Penetration Testing Professional (PTP) training course, you’ll learn more professional and advanced penetration testing skills. During your training, you’ll have access to your very own lab environment to perform real-life pentesting scenarios for topics such as Finding and Exploiting DLL Hijacking Vulnerabilities, NetBIOS Hacking, and more. Read more about this course here. Upon completing this course, you’ll have the choice to become a certified Professional Penetration Tester (eCPPT). During the certification exam, you are expected to perform an actual penetration test on a corporate network modeled after a real-world scenario. Needless to say, you’ll prove that you have the skills required to be a successful pentester. Learn more about this certification here. 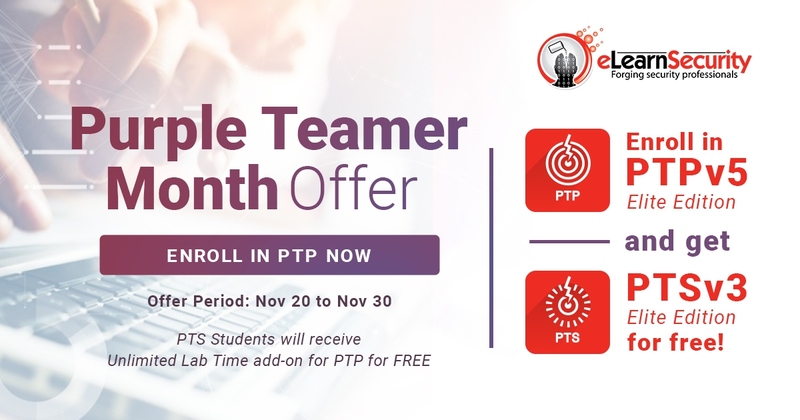 If you are already a PTS student, there’s no reason why you shouldn’t be able to enjoy our November’s Purple Teamer month offer too! That’s why we’ve decided to offer you unlimited lab time for free when you enroll in the PTP training course until November 30th. Wondering if PTP is the right training course for you? Here are 10 reasons why we think it is. Ps. Feel free to contact us directly on Facebook if you have any question about this month’s offer(s).